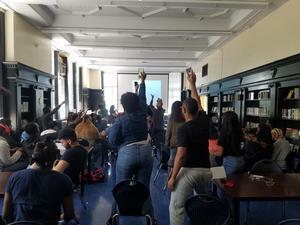 A. Philip Randolph Campus High School was thrilled to welcome back recent Alumni from the Class of 2017 and Class of 2016 at today's Alumni Day. Our Alumnus prresented to the Class of 2018 about some of their experiences and challenges with transitioning from High School to College. 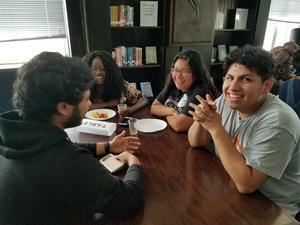 Students and Alumni were then treated to lunch where they had the opportunity to network with each other in small groups. 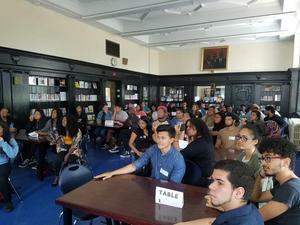 Many thanks to our Alumni Edward Romero, Eileen Figuero, Justin Juan, Miguel Medrano, Tamia Ejepopko, Chrisjen White and Danny Rodrigues who were so generous with their time, and to counselors Estefania Moronta, Hylenne Goris and Ana Cruz who organized this event.